My idea for the urban landscapes for Always Follow Ur Dreams!! 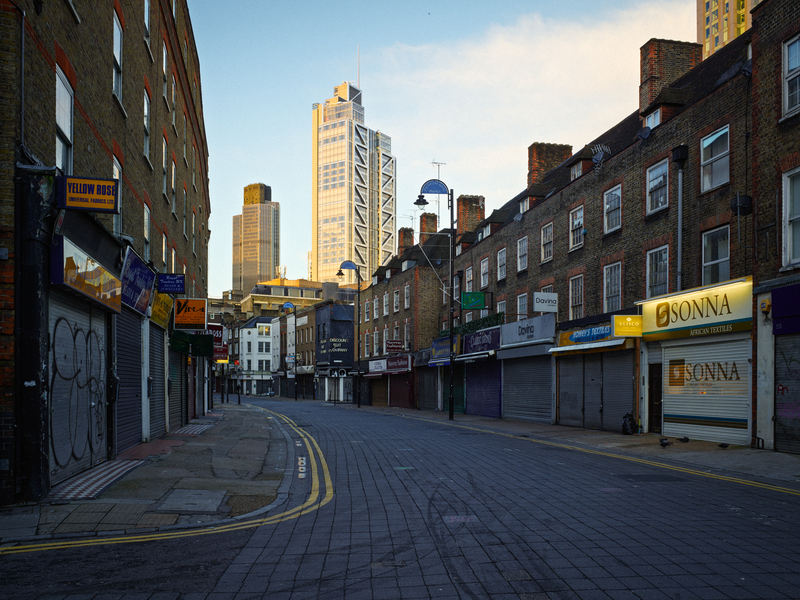 is to shoot urban scenes without people. People immediately attract a viewer’s attention and I want to avoid this. Rather I want the viewer to take the ideas put forward in the text and project these into the photograph. This is easier said than done as East London is a busy place… Today, I decided to make an early start so that I could experiment with making images in the early morning before there are too many people are around. I left home in my car and headed for the East End at 4.30 am. I am interested in Leman Street because at the turn of the 20th century The Poor Jews Temporary Shelter used to be at number 82. In 1905 following much lobbying by anti-immigration right wing interests the Aliens Act was passed. This placed considerable restrictions on the right to enter Britain as an immigrant. The process for sorting out immigration papers was long and many impoverished Jewish people were provided with temporary shelter at number 82 as their immigration application ran its course. As you can see the building there at the moment is a little different!! 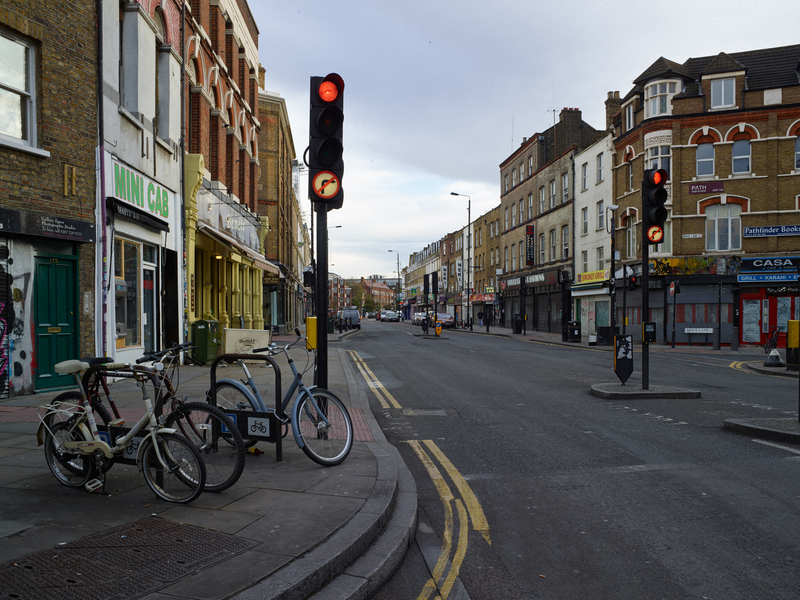 The junction of Bethnal Green Road and Brick Lane was notorious in the 1970s. It was the place where the National Front used to hand our ‘racist’ literature. 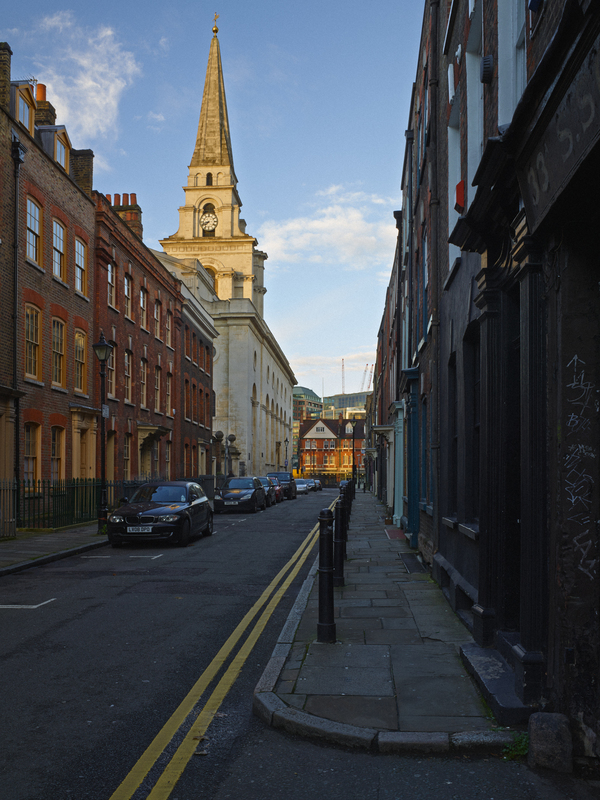 It is right in the heart of Spitalfields with its largely immigrant population. In 1978 the National Front inflamed tensions even more by moving its head office to Excalibur House, 73 Great Eastern Street, Hackney, London EC2 – very close to Spitalfields. 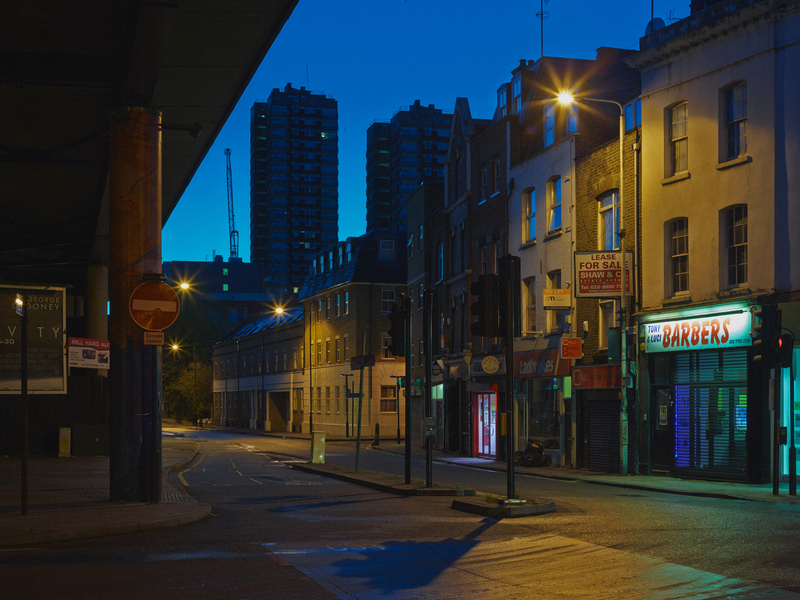 Here is an early morning urban landscape showing the road and the junction with Brick Lane. This was taken around 8 am and I just about managed to get a shot with no people…in fact there is one man in the distance. I like this photograph and it may well be a keeper. I might have another go just a little earlier to see if I can get a picture completely free of people. By 1900 many of these streets were entirely Jewish. 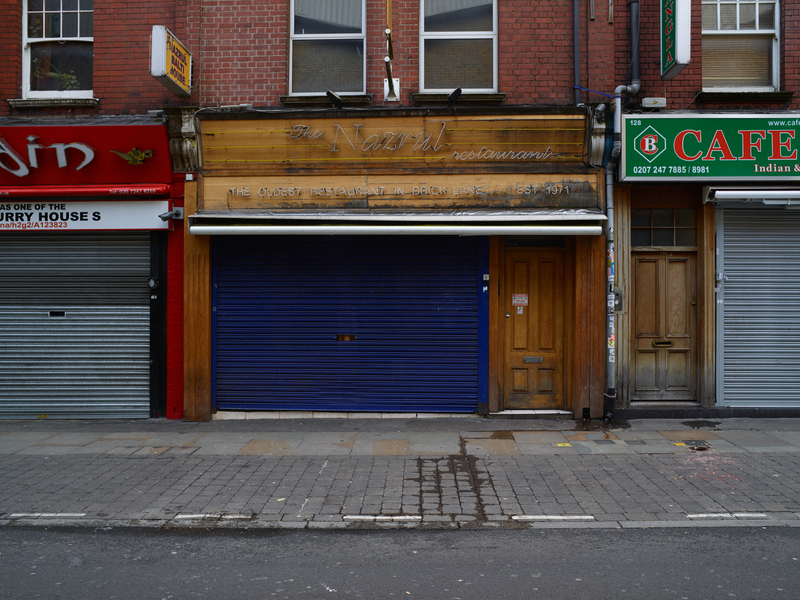 40 Hanbury Street for example was in the 1 February 1918 edition of the Jewish Chronicle announcing the death and funeral of the head of its household, Wolf Biber, a master butcher born in Vienna in 1860. I want to use an image from this area to set against a historic text (probably from Charles Booth) which will talk about the appalling living conditions of Jewish immigrants at that time. It’s looking good Keith. I must talk with you and John on Wednesday re series and maintaining complementary tones etc. 4.30am! Just shows how dedicated you are. Dedicated yes but it worked was finished by 11 am. Then got stuck in traffic coming home. Lots of parades in the City!! Yes more promising images here and well worth the early morning alarm!. 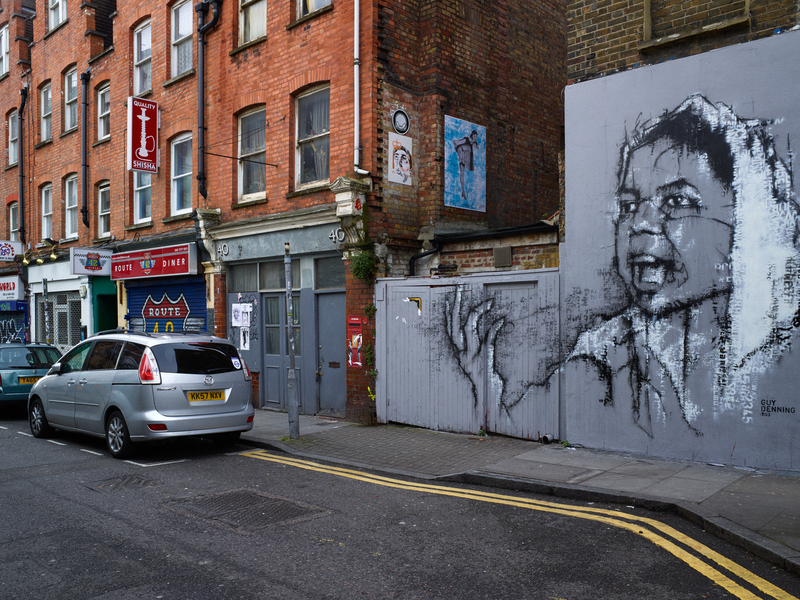 I particularly think that Hanbury street offers a great deal without any text, the mural and the direction of flow on the image really opens a discourse for me. Low light at ground level with the higher images bathed in warm light is very evocative. Just wondering about Leman street as the store looks slightly tilted, maybe it’s me. Thanks John. 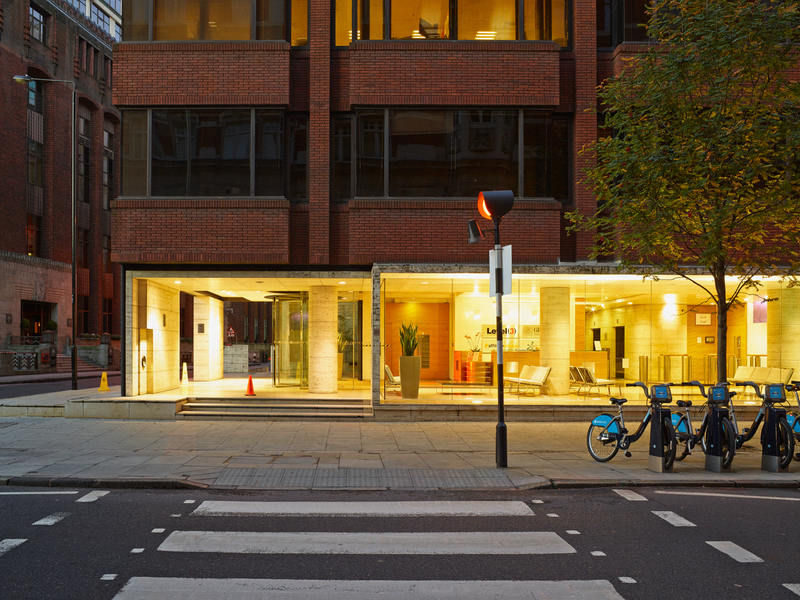 You may be right about the Leman Street image. The one I showed in this post I took with the camera tilted upwards with a view to correcting the verticals in post processing. I have decided to use a different image taken closer in without tilting the camera and with the zebra crossing vented in the frame. it’s an interesting series of pictures. The style of your first picture (Cable Street) reminded me of pictures by Rut Blees Luxemburg. Thanks for the encouragement and the link….I’ve not really looked at Rut Blees Luxemburg’s work before but the the city, the darkness and the rich colour all strike a chord…must dig deeper into his work. I discovered her pictures by chance and was impressed by colours created by the night city light.